In August, Helsinki is full of life and people take joy from the rest of the warm summer nights. Dance at the festival, streets and islands, practise yoga or enjoy wooden sailboat​s. 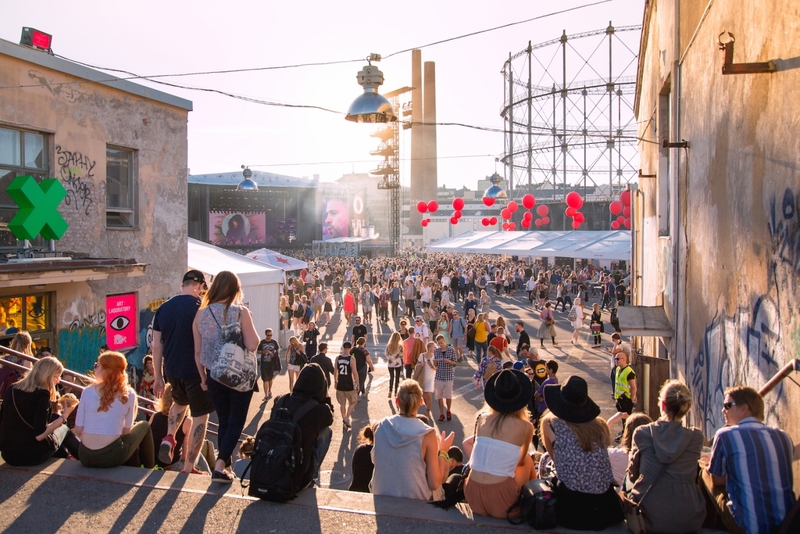 If you love music, Flow or Weekend Festival might be your choise, and if you want to dance at the streets, join Kallio Block Party. Art lovers will enjoy URB16, Art goes Kapakka, Runokuu and Korjaamo Stage Festival, and of course Helsingin Juhlaviikot and Taiteiden yö. One of the new festivals is Magnesia Festival, that fulfils Lonna island with yoga, music and workshops. Dancing is always fun, but even better if you do it at an island (Isle of Sheep at Lammassaari) or in an amusement park (Linnanmäki every Thursday). The idea behind Restaurant Silo 468 is to provide a unique environment where people can enjoy fun beverages, good food, soulful music and a great environment. Oil Silo 468 is a steel silo that has been turned into a light artwork and a venue for special events. The dinner fee includes a table filled with barbecue food and the round trip by boat to the venue. If you need to sell or buy second hand clothes, Cleaning Day is for you! Cleaning Day is a new day of celebration for friends of flea markets and recycling. The neatest festival of the year changes cities and neighborhoods into huge flea markets and marketplaces. Other good options Hakaniemi Sunday Flea Market and Konepajan Bruno. Sport events fulfil the city: if Helsinki City Marathon or Helsinki City Triathlon is a little bit too much, try Twilight Run or Weetabix Triathlon for children. BMX racing Nordic Championship is the largest BMX-event ever held in Finland and Eezy Basket is an cozy street basketball event. The Säynätsalo workshops are for designers and r & d professionals: interior designers, product and package designers & landscape architects. The participants may continue the weekend in the International Alvar Aalto design seminar in Jyväskylä on 27-28.8.16 with a special fee 180 € for the workshop participants. Participation for the workshop and the buses Helsinki-Säynätsalo-Helsinki are free of charge. Registration by 14 August: kati.hienonen@perhosvaikutus.com. Viaporin Tuoppi has been a live show for the Finnish wooden sailboat tradition for more than 30 years and is unique in its kind. It will once again gather together wooden beauties, their crews and enthusiasts. A lovely option to enjoy unique boat is also Cannon Sloop Diana: you can step aboard cannon sloop Diana, which has been built according to its 1700s role models, and sail the coastal waters of Suomenlinna. Youtubers are today’s rockstars! Tubecon is the biggest YouTuber convention in Scandinavia created by Youtubers. It’s an open event that gives creators, fans and industry members a place to meet.